Little Bell and the Moon is a touching, gentle picture book by Giles Paley-Phillips and illustrated Iris Deppe. It is the type of book which brings a little lump to my throat every time I read it to my two girls, and yet, by the end of the book I am beaming with an enormous smile, looking into the eyes of Lara and Holly, knowing that they understand the magic of it too. Little Bell is a little girl who has a strong bond with the Moon who shines down on her. Over the years, Little Bell and moon share a lot together but eventually Little Bell isn't quite so little any more. As she grows old and frail, the moon stays with her until she eventually passes away. Little Bell's soul drifts up to the moon for one last adventure and she becomes a star, shining brightly in the sky. The first time that I read Little Bell and the Moon to Lara and Holly, I was a bit taken aback by the topic of death - it just isn't something that often features in children's story books and I was worried that it would raise a lot of questions from the girls, just before bedtime! However, the story tackles the topic of old age, frailty and death with such sensitivity that Lara really stopped to think about what happens to you towards the end of life. The illustrations in the book are quite dark with layers of blues and blacks to add detail. 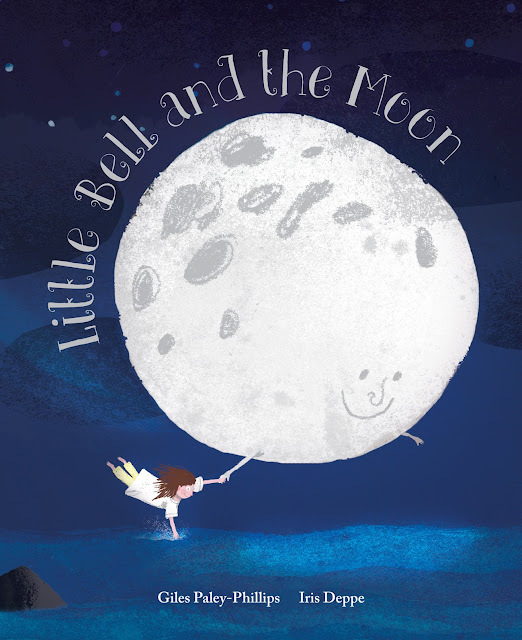 The moon, and Little Bell are bright and light additions to each page which really stand out. On each page there are also one or two brightly coloured additions such as hot air balloon, boat sails, butterflies or leopard eyes and it gave the girls something to look out for on each page. I think Little Bell and the Moon, by Fat Fox Books, is a delightful children's picture book and, with its gentle rhyme, is perfect for bedtimes. I don't think it is a book that the girls would necessarily pick as their first choice for bedtime (big, bold and silly tends to be their thing) but it is a book I would choose to read to them and which I hope will leave them quietly smiling to themselves for years to come.